Sixty-two voluntary teachers resigned from the Gorkha Janmukti Morcha-affiliated Janmukti Insecure Secondary Teachers' Organisation today and formed an apolitical organisation, in a move that is being seen as a blow to the hill party. The newly-formed Hill Secondary Temporary Teachers' Organisation, which mostly has members from Kalimpong, has said it would welcome the support of any political outfit that will fight for its cause. 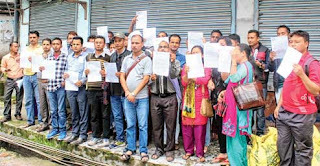 "Sixty-two members tendered their resignations from the JISTO today and the letter has been sent to Morcha president Bimal Gurung. Earlier, 15 JISTO members had quit," Roshan Chhetri, the chief-co-ordinator of the new outfit, said. "We have formed an apolitical front called the Hill Secondary Temporary Teachers' Organisation (HSTTO). A 10-member working committee has also been formed, including representatives from Jhaldhaka, Mungpoo, Gorubathan, Rungli-Rungliot, Rambi, Bagracote, Lava, Barbote and Kalimpong. This week, we will go to Kurseong and Darjeeling where more members of the JISTO will join us," he said. "There are around 170 voluntary teachers from Kalimpong subdivision and 80 of them have joined us (including the 15 who had quit JISTO earlier). We will remain apolitical but welcome the support of any party. Even if Morcha takes up our cause, we will welcome the move," Chhetri said. Around 500 voluntary teachers in the hills have been demanding job regularisation for almost a year and on November 19, 2015, Morcha formed the JISTO Movement Committee to spearhead the agitation. But on July 8, this year, the committee, which had recently been critical of the Morcha general secretary and GTA executive Sabha member in charge of education, Roshan Giri, for the hill body's failure to solve their problem, was dissolved. The JISTO, however, continued to operate. Asked about the development, Giri said: "I do not want to make any comment." Chhetri said, in 2012, the GTA and the state had appointed 269 teachers. "We were appointed as voluntary teachers by the school managing committees before 2014. The NCTE rules came into force only after 2014. We believe that the NCTE guidelines should not be applicable to us," he said.